A ghostly woman wanders, doomed to seek her lost children forever. Was she deserted by her husband? Did she kill her own children? Voices of four Tejana women recount versions of this folk tale they grew up with. 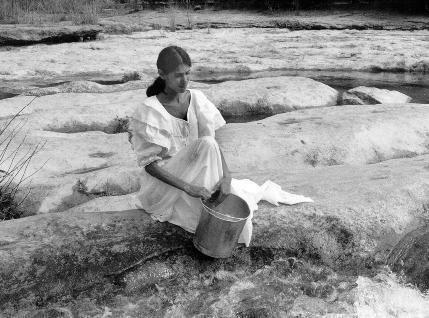 The Weeping Woman weaves together impressionistic visual images drawn from the story and the evocative Texas landscape. Black-and-white images combine with color to produce a dream-like effect. The film has screened in the Brazen Images Film and Video Festival and at the Bravo/Independent Feature Channel Student Showcase at the Independent Feature Film Market. Other screenings include the Border Film Festival, where it received a Certificate of Merit, and the Nomad Video Festival. The Weeping Woman was produced in the Masters of Fine Arts program in film and video production at the University of Texas at Austin in 1993. Dancer Renée Nuñez plays La Llorona. Nuñez studied dance at the Arts Magnet High School for the Performing and Visual Arts in Dallas and at the University of Texas at Austin. Supporting roles are played by Irene Gonzalez, Leo Aristimuno, Carlos Pineda, and Halima Foster. Gonzalez, Oralia Garza Cortés, Mary Margaret Navar, and Aurora E. Orozco provide the narration. Inspiration for the film came from a conversation with Joel Huerta. Angela Alston directed the film. David Franklin was cinematographer. Tassos Rigopoulos served as editor. The Weeping Woman was produced by Alston, Franklin, and Rigopoulos. Rob Cañas, a student in UT's Music Department, wrote the haunting score. Art direction was by Elaine Dove. Bernadine Santistevan is directing a feature film about La Llorona in the spring of 2001. She's created a haunting, evocative site you might want to visit, especially if you yourself might have caught a glimpse of this mysterious woman.